Phobos, which is about 7 miles (11.5 kilometers) across, was imaged on March 26, 2019 (the 2,359th sol, or Martian day, of Curiosity’s mission); Deimos, which is about 1.5 miles (2.3 kilometers) across, was photographed on March 17, 2019 (Sol 2350). Phobos doesn't completely cover the Sun, so it would be considered an annular eclipse. Because Deimos is so small compared to the disk of the Sun, scientists would say it's transiting the Sun. 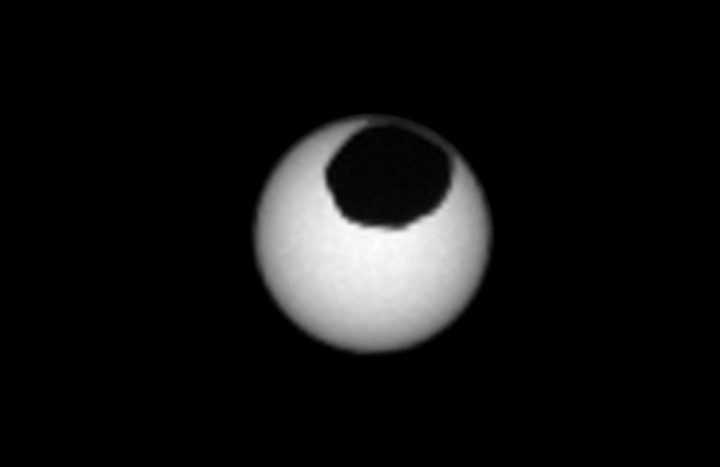 This series of images shows the Martian moon Deimos as it crossed in front of the Sun, as seen by NASA's Curiosity Mars rover on Sunday, March 17, 2019 (the 2,350th Martian day, or sol, of the mission).